Helianthus esculentus Warsz. ex Otto & Dietr. Yacón. Moche Culture. Larco Museum Collection. The yacón (Smallanthus sonchifolius) is a species of perennial daisy traditionally grown in the northern and central Andes from Colombia to northern Argentina for its crisp, sweet-tasting, tuberous roots. 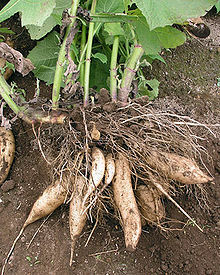 Their texture and flavour are very similar to jicama, mainly differing in that yacón has some slightly sweet, resinous, and floral (similar to violet) undertones to its flavour, probably due to the presence of inulin, which produces the sweet taste of the roots of elecampane, as well. Another name for yacón is Peruvian ground apple, possibly from the French name of potato, pomme de terre (ground apple). The tuber is composed mostly of water and fructooligosaccharide. Commonly called jicama in Ecuador, yacón is sometimes confused with that unrelated plant, which is a bean. The yacón, in contrast, is a close relative of the sunflower and Jerusalem artichoke. The plant produces a perennial rhizome to which are attached the edible, succulent storage roots, the principal economic product of the plant. The rhizome develops just under the surface of the soil and continuously produces aerial shoots. Dry and/or cold seasons cause the aerial shoots to die back, but the plant resprouts from the rhizome under favourable conditions of temperature and moisture. The edible storage tubers are large and typically weigh from a few hundred grams to a kilogram or so. The tubers contain fructooligosaccharide, an indigestible polysaccharide made up of fructose. Fructooligosaccharides taste sweet, but pass through the human digestive tract unmetabolised, hence have very little caloric value. Moreover, fructooligosaccharides have a prebiotic effect, meaning they are used by beneficial bacteria that enhance colon health and aid digestion. Yacón plants can grow to over 2 m in height and produce small, inconspicuous yellow flowers at the end of the growing season. Unlike many other root vegetables domesticated by the indigenous peoples of the Andes (ulluco, oca, and mashua), yacón is not photoperiod sensitive, and can produce a commercial yield in the subtropics, as well. Traditionally, yacón roots are grown by farmers at midelevations on the eastern slopes of the Andes descending toward the Amazon. It is grown occasionally along field borders where the juicy tubers provide a welcome source of refreshment during field work. Until as recently as the early 2000s, yacón was hardly known outside of its limited native range, and was not available from urban markets; however, press reports of its use in Japan for its purported antihyperglycemic properties made the crop more widely known in Lima and other Peruvian cities. Companies have also developed novel products such as yacón syrup and yacón tea. Both products are popular among diabetics and dieters. Yacón can easily be grown in gardens in climates with only gentle frosts. It grows well in Kathmandu, Nepal and southern Australia (including Tasmania) and New Zealand, where the climate is mild and the growing season long. The plant was introduced to Japan in the 1980s, and from there, its cultivation spread to other Asian countries, notably South Korea, China, and the Philippines, and is now widely available in markets in those countries. Yacón has also recently been introduced into farmers' markets and natural food stores in the United States and has been available from niche online health food stores in the United Kingdom since 2007. Yacon is also grown on the Atherton tablelands in Queensland. The plant can be grown using cuttings and the purple corms at the bottom of the stalks. It will not reproduce from the tubers which, if not harvested, rot in the ground providing fertilizer for following crops. Yacon should be planted in a well-dug bed in early spring, near the time of the last expected frost. While aerial parts are damaged by frost, the tubers are not harmed unless they freeze solid. Yacón is a vigorous grower much like Jerusalem artichokes. The plants grow best with fertilizer. After the first few frosts, the tops will die and the tuberous storage roots are ready for digging up. It is generally best to leave the perennial rhizomes in the ground for propagating the following spring, or, alternatively, they can be kept in the refrigerator or buried away from frost until spring. While usable-sized edible tubers develop fairly early in the season, they taste much sweeter after they have matured and have been exposed to some frost. After harvest tubers left in the sun to harden taste much better than those eaten immediately. The leaves of the yacón contain quantities of protocatechuic, chlorogenic, caffeic, and ferulic acids, which gives tisanes made from the leaves prebiotic and antioxidant properties. In colonial times, yacón consumption was identified with a Catholic religious celebration held at the time of an earlier Inca feast. In the Moche era, it may have been food for a special occasion. Effigies of edible food may have been placed at Moche burials for the nourishment of the dead, as offerings to lords of the other world, or in commemoration of a certain occasion. Moche depicted such yacón on their ceramics. ^ K. Valentova K; L Cvak; A Muck; J lrichova; V Simanek (January 2003). "Antioxidant activity of extracts from the leaves of Smallanthus sonchifolius". Eur J Nutr. 42 (1): 61–62. doi:10.1007/s00394-003-0402-x. PMID 12594543. ^ Berrin, Katherine (1997). The Spirit of Ancient Peru:Treasures from the Museo Arqueológico Rafael Larco Herrera. Larco Museum New York: Thames and Hudson. G. Butler G; D. Rivera (2004). "Innovations in Peeling Technology for Yacon" (PDF). Project Report. International Potato Center. A. Grau; J. Rea (1997). M. Hermann; J. Heller (eds.). Yacon. Smallanthus sonchifolius (PDF). 21. Institute of Plant Genetics and Crop Plant Research, Gatersleben/International Plant Genetic Resources Institute, Rome, Italy. pp. 199–242. M. Hermann M, I. Freire & C. Pazos (1999). "Compositional diversity of the yacon storage root" (PDF). Impact on a changing world, Program Report 1997-1998. International Potato Center. pp. 425–432. I. Manrique & M. Hermann (2004). "El potencial del yacón en la salud y la nutrición" (PDF). XI Congreso Internacional de Cultivos Andinos, Cochabamba, Bolivia. I. Manrique, A. Párraga & M. Hermann (2005). "Yacon syrup: Principles and processing" (PDF). Series: Conservación y uso de la biodiversidad de raíces y tubérculos andinos: Una década de investigación para el desarrollo (1993-2003). International Potato Center, Universidad Nacional Daniel Alcides Carrión, Erbacher Foundation, Swiss Agency for Development and Cooperation. 8B. 31 pages. Available in Spanish . D. Rivera & I. Manrique (2005). Zumo de Yacón - Ficha Técnica (PDF). International Potato Center. ISBN 92-9060-251-1. J. Seminario, M. Valderrama & I. Manrique (2003). El yacón: fundamentos para el aprovechamiento de un recurso promisorio (PDF). International Potato Center, Universidad Nacional de Cajamarca, Swiss Agency for Development and Cooperation, Lima, Perú. 60 p.
This page was last edited on 9 December 2018, at 20:29 (UTC).